We’ve all had fights with friends and loved ones. We’ve done or said something we’re not proud of. We’ve all hurt others and been hurt. And sometimes we don’t know quite how to say sorry. 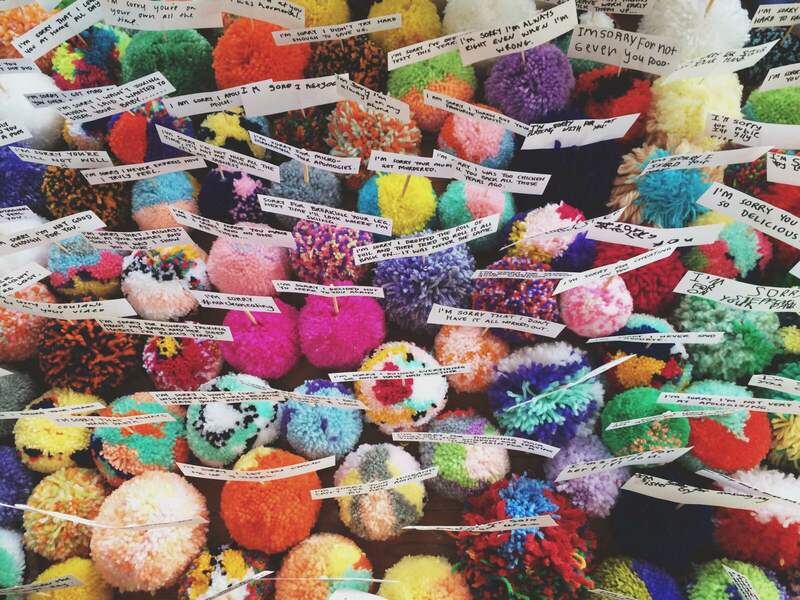 On display at Redland Art Gallery, Capalaba from Saturday 14 July and created by Rachel Burke, Apomogy is an ongoing community art project about saying you’re sorry with a pom pom. Image: Rachel Burke, Apomogy 2015. Courtesy of the artist. Apomogy began in 2015 when Rachel looked for a unique way to say sorry after having a fight with a close friend. After attaching a few apologetic confessions to pom poms Rachel decided to share them on social media. Soon after, others began sharing their own apologies with her, and with their permission Burke turned their apologies into a collection of apomogies. Since then, Rachel has received over 1000 heartfelt apomogies from around the globe; a number that continues to grow daily. The exhibition evokes a range of emotions; some apomogies tell hilarious stories of harmless acts, others tell heartfelt stories of remorse and regret. Some apomogies are shamefully relatable; others are gut-wrenchingly shocking. Regardless of the reason to apologise, Apomogy has unexpectedly brought people together from around the globe in an act of expression, reflection and craft making. Bring the kids along to the opening event for an all ages workshop on apomogy making, lead by exhibition creator Rachel Burke. For more information visit the Redland Art Gallery website.